Scientists have known for some time that Earth’s atmosphere loses several hundred tons of oxygen each day. They understand how this oxygen loss happens on Earth’s night side, but they’re not sure how it happens on the day side. They do know one thing though; they happen during auroras. According to a press release from NASA’s Earth Observatory, no two oxygen outflow events are exactly the same, which makes understanding them a challenge. They call the events ‘fountains of gas’ that escape the Earth during auroral activity, and the Earth Observatory has a mission dedicated to understanding them. Since time immemorial, people living in the Arctic Circle or the southern tip of Chile have looked up at the night sky and been dazzled by the sight of the auroras. Known as the Aurora Borealis in the north and Aurora Australis in the south (the “Northern Lights” and “Southern Lights”, respectively) these dazzling displays are the result of interactions in the ionosphere between charged solar particles and the Earth’s magnetic field. However, in recent decades, amateur photographers began capturing photos of what appeared to be a new type of aurora – known as STEVE. In 2016, it was brought to the attention of scientists, who began trying to explain what accounted for the strange ribbons of purple and white light in the night sky. According to a new study, STEVE is not an aurora at all, but an entirely new celestial phenomenon. The study recently appeared in the Geophysical Research Letters under the title “On the Origin of STEVE: Particle Precipitation or Ionospheric Skyglow?“. The study was conducted by a team of researchers from the Department of Physics and Astronomy from the University of Calgary, which was led by Beatriz Gallardo-Lacourt (a postdoctoral associate), and included Yukitoshi Nishimura – an assistant researcher of the Department of Atmospheric and Oceanic Sciences at the University of California. STEVE first became known to scientists thanks to the efforts of the Alberta Aurora Chasers (AAC), who occasionally noticed these bright, thin streams of white and purple light running from east to west in the night sky when photographing the aurora. Unlike auroras, which are visible whenever viewing conditions are right, STEVE was only visible a few times a year and could only be seen at high latitudes. Initially, the photographers thought the light ribbons were the result of excited protons, but these fall outside the range of wavelengths that normal cameras can see and require special equipment to image. The AAC eventually named the light ribbons “Steve” – a reference to the 2006 film Over the Hedge. 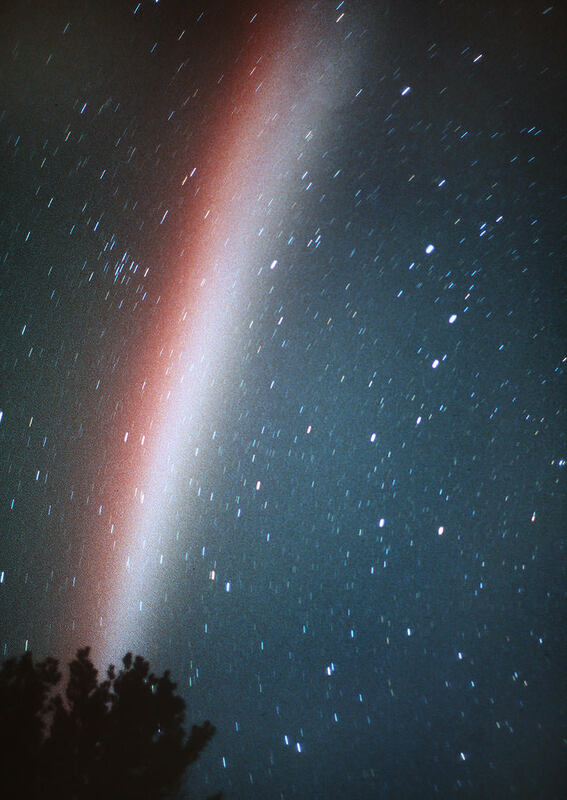 By 2016, Steve was brought to the attention of scientists, who turned the name into a backronym for Strong Thermal Emission Velocity Enhancement. For their study, the research team analyzed a STEVE event that took place on March 28th, 2008, to see if it was produced in a similar fashion to an aurora. To this end, they considered previous research that was conducted using satellites and ground-based observatories, which included the first study on STEVE (published in March of 2018) conducted by a team of NASA-led scientists (of which Gallardo-Lacourt was a co-author). This study indicated the presence of a stream of fast-moving ions and super-hot electrons passing through the ionosphere where STEVE was observed. While the research team suspected the two were connected, they could not conclusively state that the ions and electrons were responsible for producing it. Building on this, Gallardo-Lacourt and her colleagues analyzed the STEVE event that took place in March of 2008. They began by using images from ground-based cameras that record auroras over North America, which they then combined with data from the National Oceanic and Atmospheric Administration‘s (NOAA) Polar Orbiting Environmental Satellite 17 (POES-17). This satellite, which can measure the precipitation of charged particles into the ionosphere, was passing directly over the ground-based cameras during the STEVE event. Looking ahead, Galladro-Lacourt and her colleagues seek to test the conclusions of the NASA-led study. In short, they want to find out whether the streams of fast ions and hot electrons that were detected in the ionosphere are responsible for STEVE, or if the light is being produced higher up in the atmosphere. One thing is for certain though; for aurora chasers, evening sky-watching has become more interesting! To the naked eye, the Sun puts out energy in a continual, steady state, unchanged through human history. (Don’t look at the sun with your naked eye!) 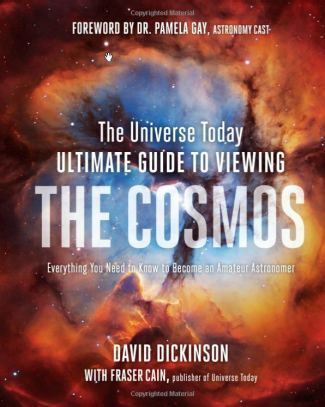 But telescopes tuned to different parts of the electromagnetic spectrum reveal the Sun’s true nature: A shifting, dynamic ball of plasma with a turbulent life. And that dynamic, magnetic turbulence creates space weather. Space weather is mostly invisible to us, but the part we can see is one of nature’s most stunning displays, the auroras. The aurora’s are triggered when energetic material from the Sun slams into the Earth’s magnetic field. The result is the shimmering, shifting bands of color seen at northern and southern latitudes, also known as the northern and southern lights. There are two things that can cause auroras, but both start with the Sun. The first involves solar flares. Highly-active regions on the Sun’s surface produce more solar flares, which are sudden, localized increase in the Sun’s brightness. Often, but not always, a solar flare is coupled with a coronal mass ejection (CME). A coronal mass ejection is a discharge of matter and electromagnetic radiation into space. This magnetized plasma is mostly protons and electrons. The CME ejection often just disperses into space, but not always. If it’s aimed in the direction of the Earth, chances are we get increased auroral activity. The second cause of auroras are coronal holes on the Sun’s surface. A coronal hole is a region on the surface of the Sun that is cooler and less dense than surrounding areas. Coronal holes are the source of fast-moving streams of material from the Sun. Whether it’s from an active region on the Sun full of solar flares, or whether it’s from a coronal hole, the result is the same. When the discharge from the Sun strikes the charged particles in our own magnetosphere with enough force, both can be forced into our upper atmosphere. As they reach the atmosphere, they give up their energy. This causes constituents in our atmosphere to emit light. Anyone who has witnessed an aurora knows just how striking that light can be. The shifting and shimmering patterns of light are mesmerizing. The auroras occur in a region called the auroral oval, which is biased towards the night side of the Earth. This oval is expanded by stronger solar emissions. So when we watch the surface of the Sun for increased activity, we can often predict brighter auroras which will be more visible in southern latitudes, due to the expansion of the auroral oval. This photo is of the aurora australis over New Zealand. Image: Paul Stewart, Public Domain, CC 1.0 Universal. Something happening on the surface of the Sun in the last couple days could signal increased auroras on Earth, tonight and tomorrow (March 28th, 29th). A feature called a trans-equatorial coronal hole is facing Earth, which could mean that a strong solar wind is about to hit us. If it does, look north or south at night, depending on where your live, to see the auroras. Of course, auroras are only one aspect of space weather. They’re like rainbows, because they’re very pretty, and they’re harmless. But space weather can be much more powerful, and can produce much greater effects than mere auroras. That’s why there’s a growing effort to be able to predict space weather by watching the Sun. A powerful enough solar storm can produce a CME strong enough to damage things like power systems, navigation systems, communications systems, and satellites. The Carrington Event in 1859 was one such event. It produced one of the largest solar storms on record. That storm occurred on September 1st and 2nd, 1859. 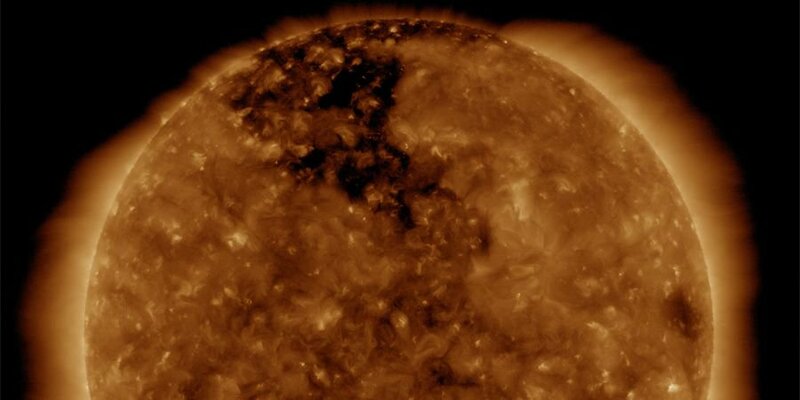 It was preceded by an increase in sun spots, and the flare that accompanied the CME was observed by astronomers. The auroras caused by this storm were seen as far south as the Caribbean. The same storm today, in our modern technological world, would wreak havoc. In 2012, we almost found out exactly how damaging a storm of that magnitude could be. A pair of CMEs as powerful as the Carrington Event came barreling towards Earth, but narrowly missed us. We’ve learned a lot about the Sun and solar storms since 1859. We now know that the Sun’s activity is cyclical. Every 11 years, the Sun goes through its cycle, from solar maximum to solar minimum. The maximum and minimum correspond to periods of maximum sunspot activity and minimum sunspot activity. The 11 year cycle goes from minimum to minimum. When the Sun’s activity is at its minimum in the cycle, most CMEs come from coronal holes. NASA’s Solar Dynamics Observatory (SDO), and the combined ESA/NASA Solar and Heliospheric Observatory (SOHO) are space observatories tasked with studying the Sun. The SDO focuses on the Sun and its magnetic field, and how changes influence life on Earth and our technological systems. SOHO studies the structure and behavior of the solar interior, and also how the solar wind is produced. Several different websites allow anyone to check in on the behavior of the Sun, and to see what space weather might be coming our way. The NOAA’s Space Weather Prediction Center has an array of data and visualizations to help understand what’s going on with the Sun. Scroll down to the Aurora forecast to watch a visualization of expected auroral activity. NASA’s Space Weather site contains all kinds of news about NASA missions and discoveries around space weather. SpaceWeatherLive.com is a volunteer run site that provides real-time info on space weather. You can even sign up to receive alerts for upcoming auroras and other solar activity. How would you like to take an all-expenses-paid trip to the Sun? NASA is inviting people around the world to submit their names to be placed on a microchip aboard the Parker Solar Probe mission that will launch this summer. As the spacecraft dips into the blazing hot solar corona your name will go along for the ride. To sign up, submit your name and e-mail. After a confirming e-mail, your digital “seat” will be booked. You can even print off a spiffy ticket. Submissions will be accepted until April 27, so come on down! The Parker Solar Probe is the size of a small car and named for Prof. Eugene Parker, a 90-year-old American astrophysicist who in 1958 discovered the solar wind. It’s the first time that NASA has named a spacecraft after a living person. The Parker probe will launch between July 31 and August 19 but not immediately head for the Sun. Instead it will make a beeline for Venus for the first of seven flybys. Each gravity assist will slow the craft down and reshape its orbit (see below), so it later can pass extremely close to the Sun. The first flyby is slated for late September. When heading to faraway places, NASA typically will fly by a planet to increase the spacecraft’s speed by robbing energy from its orbital motion. But a probe can also approach a planet on a different trajectory to slow itself down or reconfigure its orbit. The spacecraft will swing well within the orbit of Mercury and more than seven times closer than any spacecraft has come to the Sun before. When closest at just 3.9 million miles (6.3 million km), it will pass through the Sun’s outer atmosphere called the corona and be subjected to temperatures around 2,500°F (1,377°C). The primary science goals for the mission are to trace how energy and heat move through the solar corona and to explore what accelerates the solar wind as well as solar energetic particles. The vagaries of the solar wind, a steady flow of particles that “blows” from the Sun’s corona at more than million miles an hour, can touch Earth in beautiful ways as when it energizes the aurora borealis. But it can also damage spacecraft electronics and poorly protected power grids on the ground. That’s why scientists want to know more about how the corona works, in particular why it’s so much hotter than the surface of the Sun — temperatures there are several million degrees. As you can imagine, it gets really, really hot near the Sun, so you’ve got to take special precautions. To perform its mission, the spacecraft and instruments will be protected from the Sun’s heat by a 4.5-inch-thick carbon-composite shield, which will keep the four instrument suites designed to study magnetic fields, plasma and energetic particles, and take pictures of the solar wind, all at room temperature. Similar to how the Juno probe makes close passes over Jupiter’s radiation-fraught polar regions and then loops back out to safer ground, the Parker probe will make 24 orbits around the Sun, spending a relatively short amount of face to face time with our star. At closest approach, the spacecraft will be tearing along at about 430,000 mph, fast enough to get from Washington, D.C., to Tokyo in under a minute, and will temporarily become the fastest manmade object. The current speed record is held by Helios-B when it swung around the Sun at 156,600 mph (70 km/sec) on April 17, 1976. Many of you saw last August’s total solar eclipse and marveled at the beauty of the corona, that luminous spider web of light around Moon’s blackened disk. When closest to the Sun at perihelion the Parker probe will fly to within 9 solar radii (4.5 solar diameters) of its surface. That’s just about where the edge of the furthest visual extent of the corona merged with the blue sky that fine day, and that’s where Parker will be! If you’re still riding that high from seeing the recent total solar eclipse and you want to keep the party going, now’s your chance to see another of the night sky’s wonders: an aurora. That said, a totally full Moon is going to try and wreck the party. NASA announced that two powerful flares were just emitted on the surface of the Sun, casting coronal mass ejections in our direction. Over the course of the next couple of days, this should generate aurora activity in the sky outside the regular viewing areas. In other words, if you normally don’t see the Northern Lights where you live, you might want to spend a few hours outside tonight and tomorrow. Look up, you might see something. The first flare, an X2.2 event, peaked on September 6 at 5:10 am EDT and the second X9.3 flare went off at 8:02 am. Both of which came from the sunspot group AR 2673. If you’ve still got those eclipse glasses, take a look at the Sun, and you should be able to see the sunspot group right now. There are two groups of sunspots close to one another, AR 2673 and AR 2674. This follows up the X4 flare emitted on September 4th. Solar astronomers measure flares using a similar scale to other natural events, with a series of designations. The smallest are A-class, then B, C, M and finally X. Each level within the rating accounts for double the strength; it’s exponential. So, and X2 is twice as powerful as an X1, etc. The most powerful flare ever recorded was an X28 in 2003, so today’s flare is still comparatively weak to that monster. But, measuring in at X9.3, today’s flare is the strongest in almost a decade. The last one this strong was back in 2008. And NOAA is predicting that this flare could cause radio blackouts across the sun-facing side of the Earth. If you’re out at sea and depending on your radio transmissions, don’t be surprised if you’re getting a lot of static today. How do you stand the best chance of seeing auroras? My favorite tool comes from NOAA’s 3-day aurora forecast. It shows you a 3-day predictive simulation for what the solar storm should do as it buffets the Earth’s magnetosphere. You can run the simulation backwards and forwards, and you’re looking glowing green areas to come across your part of the world. But even if it doesn’t look like you’re going to see the auroras, I still think it’s worth trying. Even if you don’t get an aurora directly overhead, you can sometimes see it on the horizon, and it can be surprisingly beautiful. Here’s my timelapse video of auroras on the horizon. The big problem, of course, is the Moon. Tonight is also a full Moon, which means that awful glowing ball is going to rise just after sunset and blaze across the sky all night. You’re going to have a rough time seeing all but the brightest auroras. But I still think it’s worth trying. If you want to maximize your chances of seeing an aurora, check out the Space Weather site on a regular basis. There are also services that’ll send you a text message when there’s a powerful aurora going on in your area (just Google “aurora alert text messages”. And of course, there are handy apps that’ll make your phone beep boop when there are auroras overhead. I use an app called Aurora Alert. We’ve had three powerful flares in the last couple of days, which means that the Sun is feeling a little frisky. There could be more, and they could happen after the full Moon is over, and we’ve got some alone time with the dark sky. So stay on top of the current space weather, spend time outside, and keep your eyes on the sky. You might get a shot at seeing an aurora. And once you’ve seen one, you’ll be hooked. Not only is it aurora season in Alaska, its sounding rocket season! NASA started launching a series of five sounding rockets from the Poker Flat Research Range in Alaska to study the aurora. The first of these rockets for this year, a Black Brant IX, was launched in the early morning hours of February 22, 2017. The instrument on board was an Ionospheric Structuring: In Situ and Groundbased Low Altitude StudieS (ISINGLASS) instrumented payload, which studies the structure of an aurora. The Black Brant IX sounding rocket carried instruments to an altitude of 225 miles as part of the Ionospheric Structuring: In Situ and Groundbased Low Altitude StudieS or ISINGLASS mission. Credit: NASA/Terry Zaperach. This is not the first sounding rocket flight from Poker Flats to launch into an aurora. Starting in 2009, this research has been taking place to help refine current models of aurora structure, and provide insight on the high-frequency waves and turbulence generated by aurorae. This helps us to better understand the space weather caused by the charged particles that come from the Sun and how it impacts Earth’s lower atmosphere and ionosphere. While humans don’t feel any of these effects directly, the electronic systems in our satellites do, and as our reliance on satellite technologies grow, researchers want to have all the data they can to help avert problems than can be caused by space weather. The rocket sent a stream of real-time data back before landing about 200 miles downrange shortly after the launch. The launch window for the remaining rockets runs through March 3. ISINGLASS will fly into what is known as a dynamic Alfenic curtain, which is a form of electromagnetic energy thought to be a key driver of “discrete” aurora – the typical, well-defined band of shimmering lights about six miles thick and stretching east to west from horizon to horizon. NASA says that the five launches in the 2017 sounding rocket campaign will add to our body of information about this space through which our spacecraft and astronauts travel near Earth. By studying the interaction of the sun and its solar wind with Earth’s upper atmosphere, scientists are also able to apply the knowledge to other planetary bodies — helping us understand these interactions throughout the universe as well. Northern lights over Iceland filmed by Icelandic photographer Oli Haukur using a drone. Don’t forget to expand the screen. I knew the era of real-time northern lights video was upon us. I just didn’t think drones would get into the act this soon. What was I thinking? They’re perfect for the job! If watching the aurora ever made you feel like you could fly, well now you can in Oli Haukur’s moving, real-time footage of an amazing aurora display filmed by drone. 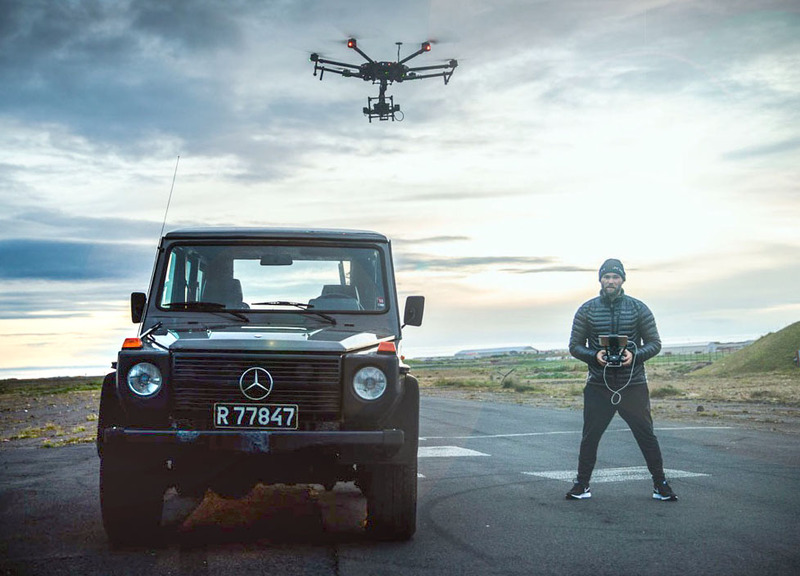 Haukur hooked up a Sony a7S II digital camera and ultra-wide Sigma 20mm f/1.4 lens onto his DJI Matrice 600 hexacopter. The light from the gibbous moon illuminates the rugged shoreline and crashing waves of the Reykjanes Peninsula (The Steamy Peninsula) as while green curtains of aurora flicker above. When the camera ascends over a sea stack, you can see gulls take off below, surprised by the mechanical bird buzzing just above their heads. Breathtaking. You might notice at the same time a flash of light — this is from the lighthouse beacon seen earlier in the video. To capture his the footage, Haukur used a “fast” lens (one that needs only a small amount of light to make a picture) and an ISO of 25,600. The camera is capable of ISO 400,000, but the lower ISO provided greater resolution and color quality. Moonlight provided all the light needed to bring out the landscape. Remember when ISO 1600 or 3200 was as far you dared to go before the image turned to a grainy mush? Last year Canon released a camera that can literally see in the dark with a top ISO over 4,000,000! There’s no question we’ll be seeing more live aurora and drone aurora video in the coming months. Haukur plans additional shoots this winter and early next spring. Living in Iceland, which lies almost directly beneath the permanent auroral oval, you can schedule these sort of things! Am I allowed one tiny criticism? I want more — a minute and a half is barely enough! Haukur shot plenty but released only a taste to social media to prove it could be done and share the joy. Let’s hope he compiles the rest and makes it available for us to lose our selves in soon. Strange plumes in Mars’ atmosphere first recorded by amateur astronomers four year ago have planetary scientists still scratching their heads. But new data from European Space Agency’s orbiting Mars Express points to coronal mass ejections from the Sun as the culprit. On two occasions in 2012 amateurs photographed cloud-like features rising to altitudes of over 155 miles (250 km) above the same region of Mars. By comparison, similar features seen in the past haven’t exceeded 62 miles (100 km). On March 20th of that year, the cloud developed in less than 10 hours, covered an area of up to 620 x 310 miles (1000 x 500 kilometers), and remained visible for around 10 days. Back then astronomers hypothesized that ice crystals or even dust whirled high into the Martian atmosphere by seasonal winds might be the cause. However, the extreme altitude is far higher than where typical clouds of frozen carbon dioxide and water are thought to be able to form. Indeed at those altitudes, we’ve entered Mars’ ionosphere, a rarified region where what air there is has been ionized by solar radiation. At Earth, charged particles from the Sun follow the planet’s global magnetic lines of force into the upper atmosphere to spark the aurora borealis. Might the strange features observed be Martian auroras linked to regions on the surface with stronger-than-usual magnetic fields? Once upon a very long time ago, Mars may have had a global magnetic field generated by electrical currents in a liquid iron-nickel core much like the Earth’s does today. In the current era, the Red Planet has only residual fields centered over regions of magnetic rocks in its crust. Instead of a single, planet-wide field that funnels particles from the Sun into the atmosphere to generate auroras, Mars is peppered with pockets of magnetism, each potentially capable of connecting with the wind of particles from the Sun to spark a modest display of the “northern lights.” Auroras were first discovered on Mars in 2004 by the Mars Express orbiter, but they’re faint compared to the plumes, which were too bright to be considered auroras. Still, this was a step in the right direction. What was needed was some hard data of a possible Sun-Earth interaction which scientists ultimately found when they looked into plasma and solar wind measurements collected by Mars Express at the time. David Andrews of the Swedish Institute of Space Physics, lead author of a recent paper reporting the Mars Express results, found evidence for a large coronal mass ejection or CME from the Sun striking the martian atmosphere in the right place and at around the right time. CMEs are enormous explosions of hot solar plasma — a soup of electrons and protons — entwined with magnetic fields that blast off the Sun and can touch off geomagnetic storms and auroras when they encounter the Earth and other planets. “Our plasma observations tell us that there was a space weather event large enough to impact Mars and increase the escape of plasma from the planet’s atmosphere,” said Andrews. Indeed, the plume was seen along the day–night boundary, over a region of known strong crustal magnetic fields. “One idea is that a fast-traveling CME causes a significant perturbation in the ionosphere resulting in dust and ice grains residing at high altitudes in the upper atmosphere being pushed around by the ionospheric plasma and magnetic fields, and then lofted to even higher altitudes by electrical charging,” according to Andrews. With enough dust and ice twinkling high above the planet’s surface, it might be possible for observers on Earth to see the result as a wispy plume of light. Plumes appear to be rare on Mars as a search through the archives has revealed. The only other, seen by the Hubble Space Telescope in May 1997, occurred when a CME was hitting the Earth at the same time. Unfortunately, there’s no information from Mars orbiters at the time about its effect on that planet. Observers on Earth and orbiters zipping around the Red Planet continue to monitor Mars for recurrences. Scientists also plan to use the webcam on Mars Express for more frequent coverage. Like a dog with a bone, once scientists get a bite on a tasty mystery, they won’t be letting go anytime soon.